The number of shares of common stock, par value $0.001 per share outstanding as of February 5, 2016 was 205,000,000. DDL is a diagnostic medical device company headquartered in Loughborough, Leicestershire, England, and is engaged in the discovery, development and commercialization of diagnostic medical devices. The Company’s initial focus has been on the development of the CGM device, which consists of a disposable patch containing a sensor, and a non-disposable miniature electronic watch with a re-chargeable power source, which can enable early detection of subtle changes in blood glucose levels. The accompanying financial statements of Nemaura have been prepared in accordance with the instructions to quarterly reports on Form 10-Q. In the opinion of management, all adjustments (which include only normal recurring adjustments) necessary to present fairly the financial position, results of operations and changes in financial position at December 31, 2015 and for all periods presented have been made. Certain information and footnote data necessary for fair presentation of financial position and results of operations in conformity with accounting principles generally accepted in the United States of America have been condensed or omitted. It is therefore suggested that these financial statements be read in conjunction with the summary of significant accounting policies and notes to financial statements included in the Company’s Annual Report on Form 10-K for the Year Ended March 31, 2015. The results of operations for the period ended December 31, 2015 are not necessarily an indication of operating results for the full year. The Company’s operations are conducted in the United Kingdom. Accordingly, the political, economic, and legal environments in the United Kingdom may influence the Company’s business, financial condition, and results of operations. As reflected in the accompanying consolidated financial statements, the Company reported a net loss of approximately $1,122,000 and net cash used in operations of approximately $688,000 for the nine months ended December 31, 2015, an accumulated deficit of approximately $5,184,000, and total equity of approximately $10,102,000 at December 31, 2015. During the three months ended December 31, 2015, the Company received proceeds of $10 million from the sale of 5 million shares of common stock and warrants to acquire 10 million shares of common stock. The warrants are exercisable over 5 years commencing on the date the Company’s Common Stock is approved for listing on a national securities exchange and have an exercise price of $0.50 per share. The functional currency of the Company is the Great Britain Pound Sterling (“GBP”). The reporting currency is the United States dollar (US$). Stockholders’ equity (deficit) is translated into United States dollars from GBP at historical exchange rates. Assets and liabilities are translated at the exchange rates as of balance sheet date. Income and expenditures are translated at the average exchange rates prevailing during the reporting period. Adjustments resulting from translating the financial statements into the United States dollar are recorded as a separate component of accumulated other comprehensive income in Stockholders’ Equity (Deficit). In August 2014, the FASB issued ASU No. 2014-14, “Presentation of Financial Statements – Going Concern: Disclosures about an Entity’s Ability to Continue as a Going Concern.” The new standard requires management to perform interim and annual assessments of an entity’s ability to continue as a going concern within one year of the date the financial statements are issued. An entity must provide certain disclosures if conditions or events raise substantial doubt about the entity’s ability to continue as a going concern. The new guidance is effective for annual periods ending after December 15, 2016, and interim periods thereafter. The Company is currently assessing the impact of the adoption of the ASU No. 2014-15 on its financial position, results of operations and financial statements disclosures. In March 2014, the Company entered into an Exclusive Marketing Rights Agreement with an unrelated third party that granted to the third party the exclusive right to market and promote the CGM and related patches under its own brand in the United Kingdom and the Republic of Ireland. The Company received a non-refundable, upfront cash payment of GBP 1,000,000 (approximately $1.521 million and $1.538 million as of December 31, 2015 and March 31, 2015 respectively), which is wholly non-refundable, upon signing the agreement. A supply cost for goods agreement will be finalized upon product approval and prior to launch, as part of the full commercial licensing agreement which will be signed closer to product approval and launch. Nemaura Pharma Limited (Pharma) and NDM Technologies Limited (NDM) are entities controlled by the Company’s majority shareholder Dewan FH Chowdhury. At December 31, 2015, the net balance due to Pharma is comprised of advances from Nemaura Pharma and expenses paid by Pharma on behalf of the Company. The Company has experienced recurring losses and negative cash flows from operations. At December 31, 2015, the Company had cash of $9,851,306, working capital surplus of $9,328,374, stockholders' surplus of $7,988,064 and an accumulated deficit of $5,183,649. To date, the Company has funded its operations through the issuances of equity, UK government grants and contributions of services and loans from related entities. The Company expects to continue to incur losses from operations for the near-term and these losses could be significant as product development, clinical and regulatory activities, consulting expenses and other product development related expenses are incurred. During the three months ended December 31, 2015, the Company received proceeds of $10 million from the sale of common stock and warrants to purchase common stock. In March 2014, we received an upfront non-refundable cash payment of GBP 1,000,000 (approximately $1.67 million) in connection with an Exclusive Marketing Rights Agreement with an unrelated third party that provides the third party the exclusive right to market and promote the CGM and related patch under its own brand in the United Kingdom and the Republic of Ireland. We have deferred this licensing revenue until we complete our continuing performance obligation, which includes securing the CE marking of the CGM patch. We expect to record the revenue in income over an approximately 10 year term from the date CE marking approval is obtained. Although the revenue is deferred at December 31, 2015, the cash payment became immediately available and has been used to fund our operations, including research and development costs associated with obtaining the CE marking approval. Research and development expenses were $840,682 and $555,795 for the nine month periods ended December 31, 2015 and 2014, respectively. The increase was due to clinical trials commencing with patients based in India using the sugarBEAT device. In addition, to get the device ready for the clinical trials, work has taken place in house and using subcontractors. The subcontracted work has also been carried out to make further modifications to the device in order to improve its functionality. We expect research and development expenses to continue to be a significant cost in future periods as we continue our clinical studies of our sugarBEAT device and pursue our strategic opportunities. General and administrative expenses were $281,236 and $228,106 for the nine month periods ended December 31, 2015 and 2014, respectively. 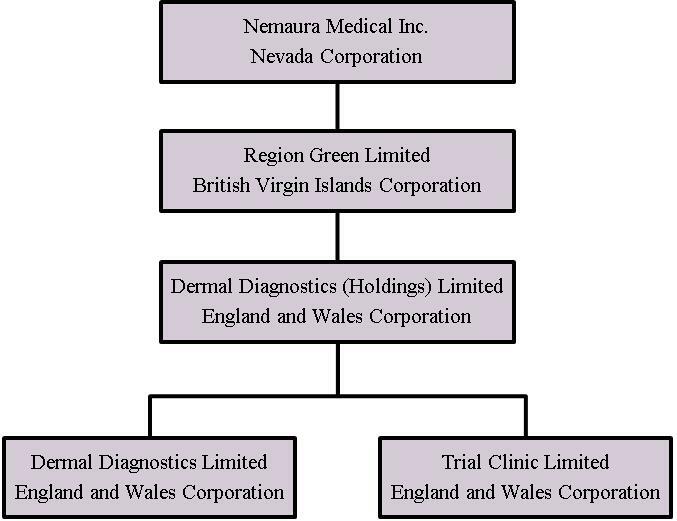 There have been no significant changes in costs over the two periods and the costs represent on going legal and professional costs associated with Nemaura Medical Inc. We expect general and administrative expenses to increase going forward in the long term, as we move our technologies forward toward commercialization and incur additional costs and expenses related to ongoing compliance with SEC reporting. For the periods ended December 31, 2015 and 2014, other comprehensive gain was $27,394 and $29,434 respectively, arising from foreign currency translation adjustments. In March 2014, we received an upfront non-refundable cash payment of GBP 1,000,000 (approximately $1.67 million) in connection with an Exclusive Marketing Rights Agreement with an unrelated third party that provides the third party the exclusive right to market and promote the CGM and related patch under its own brand in the United Kingdom and the Republic of Ireland. We have deferred this licensing revenue until we complete our continuing performance obligations, which include securing the CE marking of the CGM patch. We expect to record the revenue in income over an approximately 10 year term from the date CE marking approval is obtained. Although the revenue is deferred at December 31, 2015, the cash payment became immediately available and has been used to fund our operations, including research and development costs associated with obtaining the CE marking approval. Research and development expenses were $245,668 and $141,976 for the quarters ended December 31, 2015 and 2014, respectively. The increase is due to the increased activity, mostly subcontracted, relating to further development work on our sugarBEAT device. We expect research and development expenses to increase in future periods as we continue our clinical studies and pursue our strategic opportunities. General and administrative expenses were $83,116 and $16,790 for the three month periods ended December 31, 2015 and 2014, respectively. General and administrative increased in 2015 due to the legal expenses incurred on behalf of the company. This is in connection with issue of stock and SEC compliance costs. We expect general and administrative expenses to increase going forward in the long term, as we move our technologies forward toward commercialization and incur additional costs and expenses related to ongoing compliance with SEC reporting. We have experienced net losses and negative cash flows from operations since our inception. We have sustained cumulative losses of $5,183,649 through December 31, 2015 as technical development has continued. We have historically financed our operations through the issuances of equity, UK government grants, and contributions of services from related entities. Our cash position was $9,851,306 as of December 31, 2015. The current cash position is sufficient for the next stage of clinical studies for the European CE Mark application, and the commercial manufacture scale-up of the devices for commercial launch in Europe. The company will require additional funding for the purposes of conducting clinical studies in the USA and subsequent regulatory filings and commercial launch in the USA. This may include a combination of debt, equity and licensing fees. If we are not successful in raising the funds needed in the specified timelines, the target dates for the achievement of the milestones for US launch will be extended. There are no assurances that we will be able to raise additional capital as may be needed and meet our projections for operating expenses for a US Product launch. Net cash used by our operating activities for the nine months ended December 31, 2015 was $688,218 which reflected our net loss of $1,121,918 together with a decrease in prepayments and other receivables of $93,889, an increase in accounts payable and other liabilities of $77,904 and a decrease in prepayments to a related party of $249,459. Net cash used in operating activities for the period ended December 31, 2014 was $1,245,542, which reflected our net loss of $783,901 together with an increase in prepayment to related party for clinical trials of $494,491 plus an increase in accounts payable of $49,035. Net cash used in investing activities was $55,940 for the nine months ended December 31, 2015, which reflected expenditures on intellectual property of $50,334. For the nine months ended December 31, 2014, net cash provided by investing activities was $21,059 due to the use of restricted cash funds of $85462 in the period, less amounts spent on intellectual property and other assets. Cash provided by financing activities during the nine months ended December 31, 2015 was $10,239,717, provided from advances from a related party of $239,717 and $10,000,000 received from the sale of common stock. As a smaller reporting company we are not required to provide information required by this Item. Mr. Dewan F.H, Chowdhury, who is our Chief Executive Officer and our Principal Financial and Accounting Officer, has evaluated the effectiveness of our disclosure controls and procedures as of the end of the period covered by this Quarterly Report on Form 10-Q. The term “disclosure controls and procedures,” as defined in Rules 13a-15(e) and 15d-15(e) under the Securities Exchange Act of 1934, as amended (the “Exchange Act”), means controls and other procedures of a company that are designed to ensure that information required to be disclosed by a company in the reports that it files or submits under the Exchange Act is recorded, processed, summarized and reported, within the time periods specified in the SEC's rules and forms. Disclosure controls and procedures include, without limitation, controls and procedures designed to ensure that information required to be disclosed by a company in the reports that it files or submits under the Exchange Act is accumulated and communicated to the company's management, including its principal executive and principal financial officers, as appropriate to allow timely decisions regarding required disclosure. Management recognizes that any controls and procedures, no matter how well designed and operated, can provide only reasonable assurance of achieving their objectives and management necessarily applies its judgment in evaluating the cost benefit relationship of possible controls and procedures. Based on this evaluation, management concluded that our disclosure controls and procedures were not effective at the reasonable assurance level due to a material weakness in our internal control over financial reporting, which is described below. In connection with the preparation of our financial statements for the quarterly period ended December 31, 2015, we concluded there was a material weakness in the design and operating effectiveness of our internal control over financial reporting. We have begun to establish a number of remediation measures, which we believe will remediate the material weaknesses identified, if such measures are effectively implemented and maintained. As of the end of the period covered by the report, we continue the process of implementing and maintaining the remediation measures, but we cannot assure when or if we will be able to successfully implement these remedial measures. This information was previously disclosed in a Current Report on Form 8-K, filed on December 2, 2015.